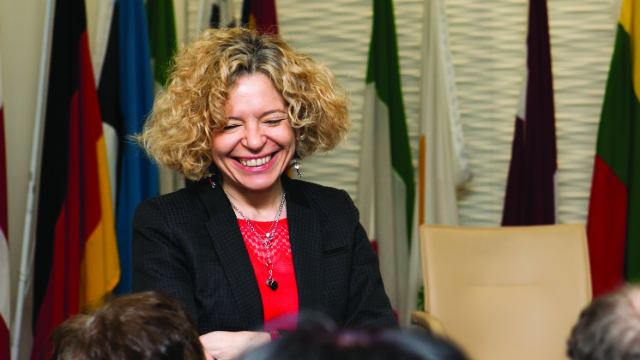 Angeliki Petrits FCIL is Language Officer at the European Commission's Directorate-General for Translation (DGT), where she has worked since 1990. She recently returned to Brussels after a six-year post in London, and talks here about the role of languages in her life. For the original Greek version, see The Linguist 54,5. "I was born in Greece and grew up bilingual in French because there was a long tradition of French in my family. At school in Greece, everyone learns a language and I wanted to take English because it was 'cool'. I learnt Italian at the Italian Cultural Institute, studied French at university and did a PhD in Linguistics in Paris. Languages are a window to the world and I loved them, even as a child, but I didn't know how I was going to use them. I was interested in linguistics and particularly in sociolinguistics – how you use language, why you use it – so my first idea was to go into academia. Then I saw a job advert for translators at the Council of the European Union. I started working at the DGT as a translator from French, Italian and English into Greek, but I was picked out for other interesting projects. I worked on machine translation, including an ambitious project in 1990 that tried to build a machine that could translate between all the EU languages (there were nine at the time). The European Commission offers language classes so I took Spanish, German and Portuguese. Just before the big enlargement of 2004, we were encouraged to learn one of the new languages and I picked Hungarian. This led to a post in Budapest in 2003-2005, where I recruited the first nine Hungarian EU translators. As Coordinator of Relations with Universities, I set up the European Master's in Translation network – there are currently 64 members from universities of the whole EU. I travelled across Europe to explain why that project was important and many times I could do that in the language of the country. Next I became Language Officer at the Commission's Representation in the UK. I loved the job in London, working within the unique and challenging situation with language education in the UK, so it was difficult to leave for Brussels this summer, but I will not disappear. I come back for Members' Day and International Translation Day. For me, there is a fuzzy line between work and pleasure, because very often they overlap. In London, I had a work event almost every evening but I enjoyed them so much. I love the theatre, so when I have free time I go to see a play. I love travelling and have a curious eye, so if I am in Liverpool, for example, I will walk from the station rather than taking a taxi, because I want to look around. I don't have much time for reading so I tend to accumulate a long list of books to read. I was in Argentina this year so I've just read Tuya by Claudia Piñeiro, which had lots of expressions in Argentinian Spanish. Next is Kundera's La fête de l'insignifiance in its original French version and then Ali Smith's How to Be Both."